Marilyn Monroe was legendarily one of the most iconic personalities of the post-war era, an almost impossibly glamorous film actress and one of the showbiz figures who came to encapsulate the essence her times and how they are remembered. Best-known, of course, as a film actress, she was also a much-underrated singer, which could turn her hand to a variety of different material in when singing in her films, and had a highly individual and seductive vocal in her sadly somewhat limited studio output. This 34-track 2-CD set brings together most of the extant recorded examples of her performing in a musical environment. Most of these, inevitably and quite reasonably, are performances from the soundtracks of her movies, the primary exceptions being titles she recorded for RCA outside of a movie environment in 1954, and the legendary performance of “Happy Birthday” for President John F. Kennedy at Madison Square Garden in 1962 a few months before her tragic and untimely death. 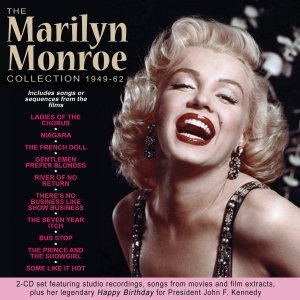 The films from which songs in this collection are taken are “Ladies Of The Chorus”, “Niagara”, “The French Doll”, “Gentlemen Prefer Blondes”, “River Of No Return”, “There's No Business Like Show Business”, “The Seven Year Itch”, “Bus Stop”, “The Prince And The Showgirl”, and “Some Like It Hot”. (It does not include a recording of “When I Fall In Love” which has sometimes been attributed to Marilyn by other compilers, but is generally recognised as having been performed by Sandra Dee). It’s a fascinating and revealing showcase of an aspect of Monroe’s varied talents and attributes which has sometimes been ignored.